The last year wasn’t a good one for Facebook. The social media giant had to deal with two major scandals which involved the data of user accounts and people don’t feel safe on Facebook anymore. On the bright side of things, the developers of Facebook know that too well and they are making important changes which are going to enable Android users to disable Facebook’s ability to track their real-life location. “Android and iOS are by far the two most popular mobile operating systems, but their location settings work differently. Android offers a single on/off switch for Location Services, so you can decide whether to share your precise location with Facebook and other apps. But iOS offers an additional option, so you can share your precise location always, only when the app is in use, or never. As a result, one of the questions we often hear from people using Facebook for Android – but not those using iOS – is whether Facebook gets their location even when they’re not using the app,” said Paul McDonald who is Facebook’s Engineering Director in a recent blog post. 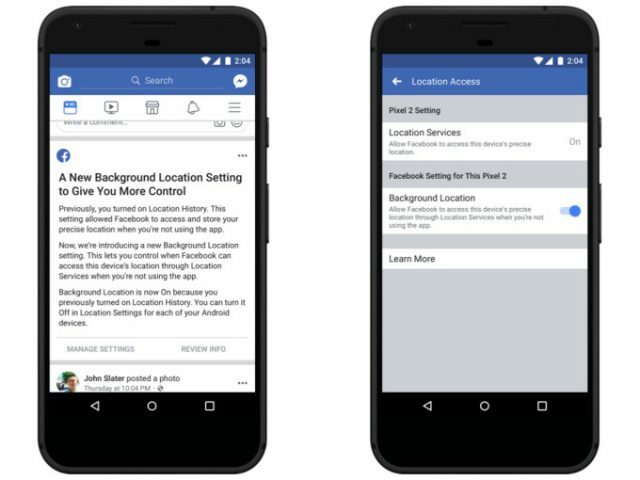 “Today we’re announcing an update to Facebook’s location controls on Android to give people more choice over how we collect location information and how we store it. We’re not making any changes to the choices you’ve previously made nor are we collecting any new information as a result of this update,” added the Engineering Director. Even though 2018 wasn’t the best year for Facebook, the social media giant did learn its lesson. We advise all Android smartphone users who are own Facebook accounts to take a better look at how the social media app is handling their private information because you can never know who might collect it and disabling the tracking feature is always a good decision.